Apple Digest: Apple Closes at All-Time High, 2 Days in a Row! Apple Closes at All-Time High, 2 Days in a Row! AAPL set yet another all-time closing high today, March 24, for a second consecutive day. AAPL is up +3.20% for the week, up +12.10% for the month, up +8.85% for the year, and up +175.98% since the March 9, 2009 market bottom. AAPL exceeded the previous all-time closing highs of yesterday, March 23, of 228.36 and 226.60 set on Friday, March 12. An intermediate-term buy/long/bull signal was generated on Friday, March 12. Previously, an intermediate-term buy/long/bull signal occurred in mid February 2009 and the race was on - until a sell/short signal just before Christmas 2009. It was a amazing bull run! Another breakout, and buy/long signal, occurred a couple of weeks later, which lasted until February 17. Below is the AAPL daily chart from December 2009, including the December 7 close of 188.95 up through today's all-time closing high of 229.37. The intermediate-term signal, the comparison of the 25 day and 50 day simple moving averages, generated a buy/long/bull signal on Friday, March 12, 2009. Therefore, AAPL is now in an intermediate-term bull market. That is, the 25d sma is higher than the 50d sma. The current closing price, the highest yellow horizontal line is now above any previous closing high, so there is no resistance above. AAPL is in uncharted terriorty, literally. There is much significant support below. The 25d sma bottomed on February 26, began ascending strongly, and now has regained both the 100d and 50d sma's.. The 25d, 50d, 100d, and 200d sma's are ascending, as the all-time highs pull the sma's upwards. The uptrend line, a rate of price ascent, is from the January 20, 2009 closing low of 78.20 up through the February 4, 2010 closing low of 192.05. The February 4 closing low has been the bottom for the 2010 pullback to date. 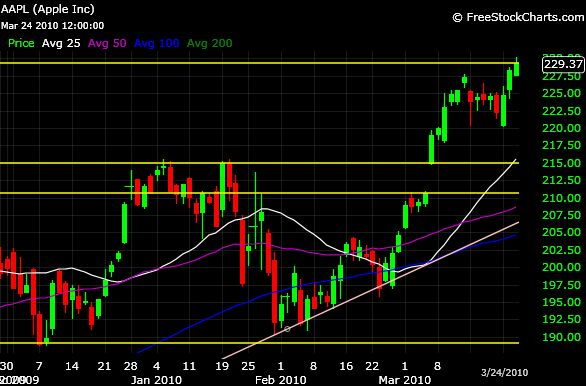 AAPL battled this uptrend line for days before breaking out above February 25. AAPL has stayed well above this uptrend line. There is no downtrend line, a rate of price descent, because AAPL is at an all-time high. How high can AAPL run until another consolidation and/or pullback? RSIs are not as high I would have guessed. There is still some upside left in the RSIs, but this bull run can't last forever. The MACD is bullish and has been since February 16. The lowest horizontal yellow line is the 10 month exponential moving average from the monthly chart, which I have overlayed on this daily chart. That is the line in the sand, so to speak, for the long term signal of a bear market. AAPL is well above this signal at the current close, the highest yellow horizontal line. AAPL continues to rally Big Time above the February 4, 2010 YTD closing low of 192.05, which has been lowest closing during the 2010 pullback. The current price is at an all-time closing high. The RSI 10 day and 25 day indicate AAPL is becoming overbought, but the recent pullback and consolidation has decreased the RSI from the highs of earlier in March. Additional consolidation and perhaps more pullback is possible, and inevitable, before another surge upwards in 2010. I stated previously that I thought the shorts, the Bears, would jump on AAPL at some point due to the inevitability of a pullback, but so far the Bulls have had a great run . The buyers have been in control. The intermediate-term trend became bullish on Friday, March 12. The long-term trend remains bullish. Apple Closes at All-Time High!